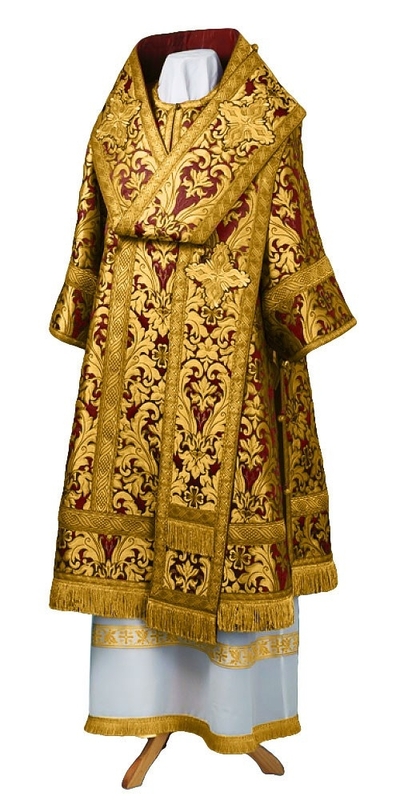 Orthodox Church liturgical Bishop clergy vestments (claret-gold) by Istok Church Supplies Corp.
Istok Church Supplies has a fabulous collection of Bishop vestments in claret and gold that can be worn for a number of liturgical and other church services. Browse through this category and find an incredible selection of these items that are made following long established canons of the Orthodox Christian faith. Buy them for yourself or as a church donation – either way they make wonderful choices. Claret is a variation of red – it’s a rich and deep color that appears stunning when combined with gold. We offer claret and gold Bishop vestments in three fabric choices- brocade with rayon threadwork, brocade with metallic threadwork and natural German velvet. We provide a variety of patterns ranging from simple and elegant to intricate and extravagant so customers can purchase according to their style preferences. Each of our featured products comes with a mention of the class of fabric being used and customers can request for an alternative fabric belonging to the same category as the one featured by making a mention in the Notes field. All our Bishop vestments consist of seven articles – sakkos, zone, epigonation/palitsa, epimanika, epitralhilion, sulok, small omophorion and large omophorion. We encourage you to take a close look at the picture and go through the extensive description provided for each individual product. Our claret and gold Bishop vestments are available with three decoration options- standard, premier and luxury. They are fully lined with 100% natural rayon. Customers have the option of adding natural velvet inserts and choose from given list of embroidered icons. All our claret and gold Bishop vestments are made to order and custom tailored by experienced tailors who have full knowledge of Orthodox Christian rules and regulations governing vestments at our premises in Europe We request you to visit our measurement chart and provide us with your individual dimensions. We pass on savings to customers and try to make our products as affordable as possible. Choose from our selection of magnificent Bishop vestments and increase the prestige of your church within your community!